Introduction: Laparoscopic excision of GIST tumors is safe and oncologically effective. GIST tumors at the gastroesophageal junction (GEJ) introduce special difficulties due to the complex accessibility of the proximal stomach by laparoscopy and concerns of narrowing the GEJ, while ensuring an oncologic resection. 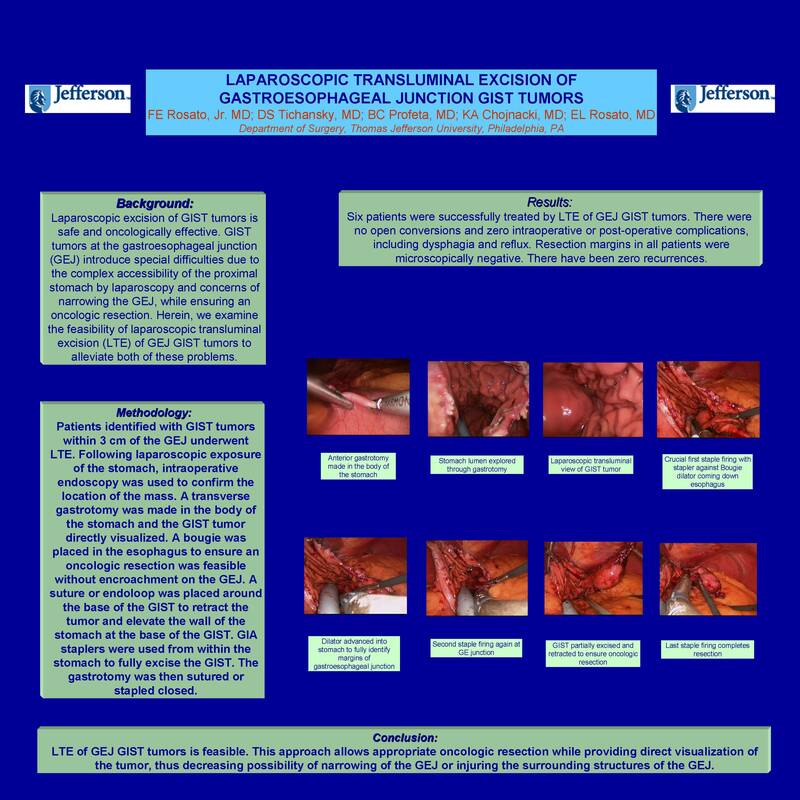 Herein, we examine the feasibility of laparoscopic transluminal excision (LTE) of GEJ GIST tumors to alleviate both of these problems. Methods: Patients identified with GIST tumors within 3 cm of the GEJ underwent LTE. Following laparoscopic exposure of the stomach, intraoperative endoscopy was used to confirm the location of the mass. A transverse gastrotomy was made in the body of the stomach and the GIST tumor directly visualized. A bougie was placed in the esophagus to ensure an oncologic resection was feasible without encroachment on the GEJ. A suture or endoloop was placed around the base of the GIST to retract the tumor and elevate the wall of the stomach at the base of the GIST. GIA staplers were used from within the stomach to fully excise the GIST. The gastrotomy was then sutured or stapled closed. Results: Six patients were successfully treated by LTE of GEJ GIST tumors. There were no open conversions and zero intraoperative or post-operative complications, including dysphagia and reflux. Resection margins in all patients were microscopically negative. There have been zero recurrences. Conclusions: LTE of GEJ GIST tumors is feasible. This approach allows appropriate oncologic resection while providing direct visualization of the tumor, thus decreasing possibility of narrowing of the GEJ or injuring the surrounding structures of the GEJ.